“In a nutshell, starting June 1, 2012, Stampin' Up! will release one annual catalog, comparable to (but smaller than) the current Idea Book & Catalog, and two seasonal catalogs, comparable to (but larger than) the current mini catalogs." 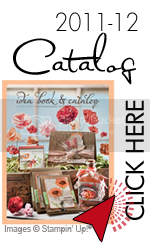 The current Idea Book and Catalog 2011-2012 will expire at the end of May instead of the end of June as originally planned. The Occasions, Summer, and Holiday Mini Catalogs will be replaced by two seasonal catalogs called the Holiday Catalog and the Spring Catalog. The first Spring Catalog will run from the beginning of January, 2013 through May 31, 2013. The seasonal catalogs will be larger in both size (8 1/2" x 11") and page count (about 40 pages) than the current mini catalogs. Mark your calendars! Stampin' Up! has announced the dates they will be delivering the "news" on which products will be retiring from their line-up. The Retired Stamp List will be released on April 15, 2012 and the retired stamps will be available through May 31, 2012. The Retired Accessories/Décor Elements Lists will be released on April 25, 2012 and will only be available while supplies last so be sure to mark your calendar and ORDER EARLY. The Simply Adorned line will be discontinued with the next big catalog. The Décor Elements line will be discontinued with the next big catalog. 2010-2012 In Color items (Pear Pizzazz, Blushing Bride, Peach Parfait, Concord Crush, Poppy Parade) will be retiring with the next big catalog. If you have had your eye on any of the Decor Elements (vinyl die-cuts for your walls and more) or Simply Adorned or you really love the retiring In Color Items, purchase them now before they disappear. If you purchase now – before Saturday March 31st, you will not only be sure to have your favorites, but you will also reap the benefits of Sale-a-bration when you order $50 or more! Call Us at 608-237-7103 , E-mail Us HERE or Click HERE to Order Online!